When the Celluloid Zeroes started talking about doing a Ken Russell round of reviews, I thought I’d write up Savage Messiah . Since Russell is most remembered now for horror and the cult rock opera Tommy , I wanted to look at something different. Unfortunately, I’d lent my copy to someone I don’t see often. Running an Amazon search on his name turned up a 1971 musical that I’d never heard of, which would be released on blu in time for the roundtable. I preordered it and hoped for the best. The Boy Friend started life as a musical play by Sandy Wilson that was first presented in London in 1954. It’s a light romantic comedy about students at Mme Dubonnet’s School for Young Ladies along the French Riviera. There’s a carnival ball coming up, and Polly tells everyone she’ll be coming with her boyfriend. Not actually having one yet, she asks the boy who delivers her costume to go with her. After singing, dancing, mistaken impressions, and more singing everyone winds up happy and engaged. Even the starfish and jellyfish get happy endings. The play was a sort of pastiche of Jazz Age culture and theater. It was a hit at the time and quickly drew the attention of film producers, who were busily turning every musical they could grab into colorful extravaganzas in a bid to win audiences back from television. The Boy Friend remained unfilmed for more than a decade, however, until Ken Russell decided to make it turn in on itself like an airy and breezy ouroboros. The stage manager imagines what he could do with a royal playhouse budget. Just as the play used elements of 1920s theater, the movie reflects musical films of the 1950s (when the play was first presented) while additionally referencing the theatricality of music-driven films in the 1930s. Confused yet? Don’t worry. You can watch and enjoy the film knowing very little of the circular call outs, but I do think that having seen movies like Kiss Me, Kate or Singin’ In The Rain can add a lot to the experience. Polly imagines herself in a Greek romance. The movie is set in the late 1920s or early 1930s in the south of England. The entire story takes place inside of a theater, where a small cast is putting on a matinee performance of The Boy Friend , as though the play really had been written back then. The lead actress has suffered an injury, so the part of Polly will have to be played by the assistant stage manager, who is also named Polly (Twiggy). Many of the players have the same name, or are at least referred to, as their role. If that seems confusing, I actually believe it helps. While the context shifts wildly between backstage, onstage, and fantasy there is only one identity for anyone. Polly sings her first number too slowly, throwing the rest of the cast into disarray. The actors in the play are going through their own love comedy that mirrors the goings-on of the performance. The play revolves around the relationship between Polly and Tony (Christopher Gable), which is threatened by deceptions and misunderstandings. The movie focuses on the lead players as their own romance begins during the course of the performance and follows the same course of secrets and revelations. Tony conspires with Dulcie off stage. Complicating matters is the unannounced presence of a prestigious Hollywood filmmaker. De Thrill (Vladek Sheybal) watches the play fumble along, and various players try to attract his attention. They get it, though not always in a positive light. He’s a fascinating character, complex and layered in his own quiet way. De Thrill stands in for the film’s audience, laughing at the attempts to keep the play on track, delighting in the dancing, and getting emotional at the sappy songs. But he’s also visible to the players, who mug shamelessly at him and vie for his approval. The audience effecting the actors. De Thrill watches a performance unravel. De Thrill also links the onstage action to the world of cinema. Many of the fantasy sequences are visions of how he would transform the numbers for film. Elaborate sets, extreme angles, bizarre costumes: all of the tricks employed by Hollywood musicals of the 1930s are on display through his eyes. In him, the final link is established, and the 1970s film based on a 1950s play drawing on 1920s plays becomes a movie about 1920s plays being turned into 1930s movies. De Thrill imagines a dance number being performed on giant turntables. If you can’t yet tell, I adore The Boy Friend . Aside from the dizzying recursion of adaptation, it’s a spectacle. The fantasy sequences, of course, are gorgeous, but the playhouse itself is filled with rich colors and sumptuous textures. Above that, it’s a very cinematic experience. Super closeup shots mix with sedentary theater perspective. Shot techniques of varying periods join deliberately to give it a feeling as though the entire history of film takes place within the theatre. While the plot is simple, the performances are a delight, and watching the competitiveness play out onstage as Polly tries simply to muddle through is a lot of fun. It’s a very self-conscious movie but a very playful one as well. The result is that I spent the entire runtime enthralled, never once feeling the length of it. I realize that musicals aren’t for every one, and this one is admittedly very indulgent. There are plenty of sequences that add very little to the narrative, taking a readily understood emotion and extrapolating it into a lengthy dance scene. I’m not in the least surprised that it didn’t perform well at the box office, although it may have done better without the deep cuts that were made for the US. What I didn’t see coming was that I really enjoyed the performance of popular fashion model Twiggy. Although far from being the best singer or dancer in the cast, she did a creditable job, even managing a tap dance with co-star and choreographer Christopher Gable. Additionally her slim physique perfectly fit the Jazz Age wardrobe. Most importantly, she portrayed the shy vulnerability of Polly as well as the comically awkward efforts to keep up with the well-rehearsed players. Polly reads her lines from a prop bouquet. I picked this movie purely by chance and convenience, and I wound up discovering a film that ranks high among my favorites. Thank you, Ken Russell. You were one of the best. Mr. Browne and the headmistress remember their time together in Paris. Julie Andrews’ Broadway debut was in the lead role of Polly Browne. She was offered the part of Rita in the film adaptation but declined. In 1967 Andrews starred in the film Thoroughly Modern Millie , another romantic musical comedy set in roughly the same period that features characters hiding their wealth. Vladek Sheybal would later play the star-making satanic figure in Cannon’s biblical rock opera The Apple . 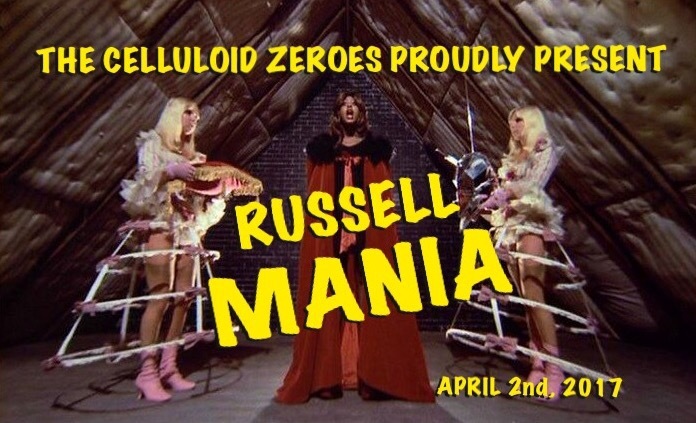 This review is part of the Celluloid Zeroes Russell-Mania Roundtable. We’re reviewing films by auteur director Ken Russel, because reasons!